Venice is drowning – or that seems to be the impression of most of my friends when they asked me about my visit to Venice last week. 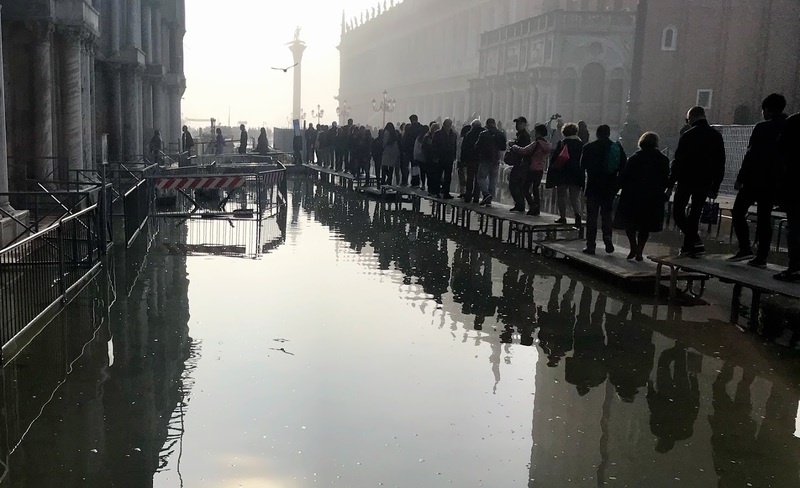 For days, they had seen news reports of Saint Mark’s Square covered in high waters, with images of tourists walking around in the acqua alta up to their hips or even up to their waists. 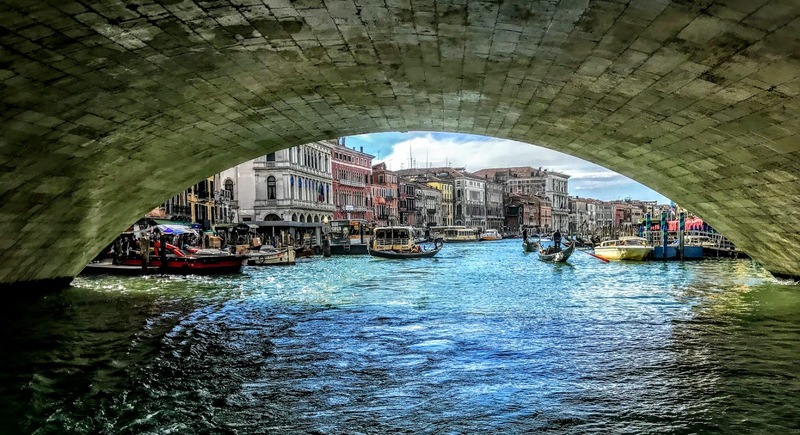 Earlier this year, the Mayor of Venice, Luigi Brugnaro proposed a cap on day-trippers. Before the summer season arrived, crowd-control gates were installed at pinch-points in May to distribute the flow of tourists. When the crowds get too thick, the police close the main entrances, limiting access to local residents and workers who possess a special pass. 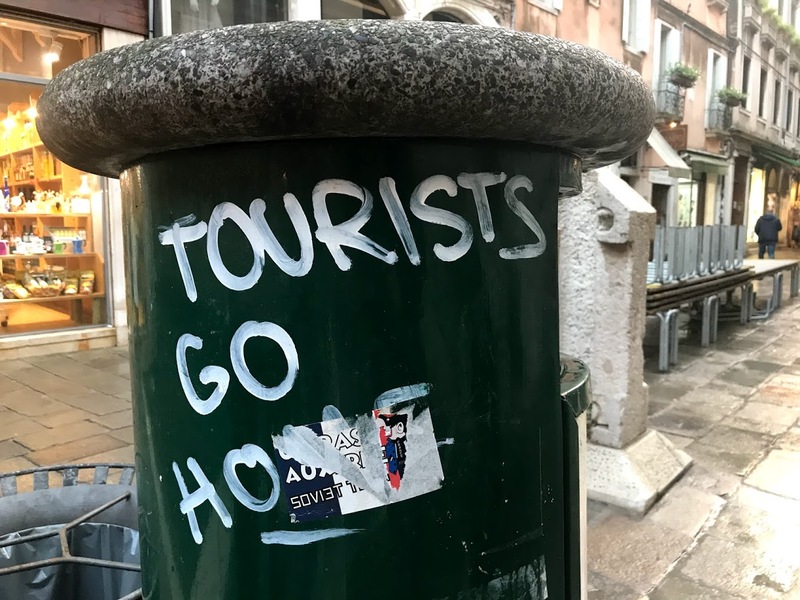 There are more tourists and fewer residents in Venice, making many wonder whether Venice is danger of drowning, not under the waters of the Adriatic but under the flood of visitors who seem to rise in numbers each year. A few weeks ago, in a feature on tourism headed ‘Wish you weren’t here,’ the Economist recalled how a study in 1988 found Venice could hold at most 20,750 visitors a day – a figure that is about a quarter of tourist traffic 30 years later. Yet the increased demand has not been met by building better public transport. Venice has lost more than half its population in the past 50 years. Those who stay are left wondering how they can fight to reclaim and preserve their city. The local population has dropped below 55,000 as Venetians find themselves priced out of their home city. 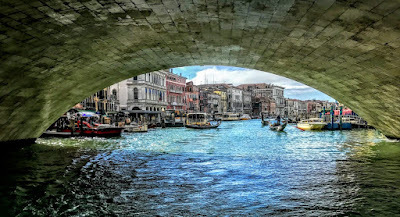 If Venice is in danger of sinking, then it is in more imminent danger of shrinking. Venice has always been a popular destination, even before the ‘Grand Tours’ of the 18th century. Ever since the fall of the Venetian Republic in 1797, local people have complained that Venice is being overrun by visitors. Napoleon wanted to own Venice, and ever since the Victorian era writers and artists have sought inspiration – and romance – in its waters and in its architecture. But the city is groaning under the weight of tourism and in recent years tension has grown between visitors and local people, who fear their city is becoming just another Disneyland. Ryanair, ‘Facebook selfies,’ cheap flights, and towering cruise ships, now mean that on any given day that there are more visitors than residents in Venice. But the majority of visitors are day-trippers, and few stay overnight in the city. This means most of them spend their time and their money in the same small areas. Venice has 30 million visitors a year, of whom many are grab-and-go day-trippers. It is a timeless city where no one has any real time for her. Few of the day-trippers venture off the tourist trail to explore side streets and quieter piazzas. Small businesses and local shops are being replaced by souvenir stalls and fast food restaurants to cater for the day-trippers who prefer to munch rather than lunch and are gone once darkness begins to fall. It is all too easy for me to descend into snobbery about other tourists. I like to think that I have visited Venice because of my cultural tastes, including architecture, history, Byzantine churches and palaces, its influence on shaping the cultural identity of Europe today. But why should the music of Vivaldi and the musings of Ruskin make my visits more culturally acceptable than the group of young women from northern Europe who want to enjoy a hens’ weekend in Venice or young men who have come for a stag night or a football match? I watched dismissively what I could too easily see as hordes who had been disgorged from coaches and liners early in the morning, follow the coloured umbrellas and flags from San Marco to Rialto, stopping only to buy cheap Chinese-made reproduction masks, and then leave in the early evening, imagining someone was going to switch off the lights when they left. But day-trippers are important in any society. They go home with positive impressions, many want to read and learn more, and some will return. I had been to Venice on three or four-day trips in the past before staying for the best part of the week this month. On a recent day-trip from Seville to Tangier, I realised it might have been the first encounter for many in the group with a Muslim-majority or Arabic-speaking society, and I had no doubts that they would return home with different attitudes, perhaps even return to Morocco for a longer visit. However, in Venice frustration with visitors has grown to the point last summer that angry locals plastered the city with flyers that scream out: ‘Tourists Go Home!’ But perhaps visitors are essential to the survival of Venice, if the right sort of tourists are attracted. Tourism could be the problem, but it could also be a solution, keeping businesses alive but also making people aware of the crises that Venice faces and that must be addressed if Venice is to be saved. Recent measures introduced to control tourism and protect the city include bans on new hotels and takeaway food joints in the historic centre. But Unesco’s concerns about cruise ships, mass tourism and damage to the fragile lagoon ecosystem have been met with empty promises but no concrete proposals. Venice is dwindling away. Around 1,000 residents move to the mainland every year, unable to afford rising rent demands, pushed to find employment outside tourism, or unwilling to live in a city that is losing a sense of community.